Just thought, since i don't have much to add crochet wise, that i'd show you guys who you're dealing with. 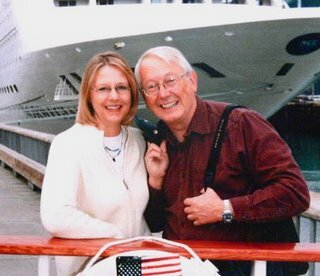 That's a shot of my wife Karol and me when we went on a cruise to Alaska. What a beautiful place, and full of crafters! I'd really like to go back, but next time go by land. It was heart breaking to see all that beautiful scenery pass by and not be able to get off and look around. Oh.. I'm sendin off a shipment of hooks tomorrow (thanks to you kind folks for being so patient). This new job has me coming home pretty tired for now. But it's fun and interesting and i've got great folks to work with. And i do have a few extra hooks now, and i'll post a picture soon, along with prices and description. I promise! Thanks everyone for checking in. omg.. you guys are SO cute !! and here i was thinking you were some grizzly adams type with a beard .. so much for my mind and imagination! lol.. Beast? I don't see a beast!! I agree with the other two ladies, you two make a really great couple! What a handsome couple! And you both look so happy! 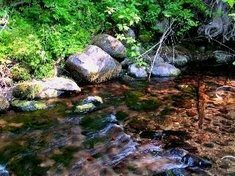 Alaska is a dream vacation for me... someday! Thanks Amanda and Drew. Alaska IS a dream vacation, and if you get to go, consider taking the ferry up instead of a cruise ship. That way you can spend more time on the shore, and less on the boat. But the inland passage is just drop dead jaw dropping beautiful. Go if you can. Amanda... checked your blog.. love your work. You 2 remind me of my memie and pappy!!!! Nice to have a face with a name!! !